Candlelight is the je ne sais quoi that transforms an evening gathering into something special. But it doesn't make sense to purchase the candles and fixtures when your wedding or party lasts only a few hours. Rent them instead. The Golden Hour Candle Company takes all the hassle out of creating candlelight for your event. Providing candle rentals in and around Pittsburgh, PA. Whether it's on dinner tables or scattered about a cocktail hour, votives are a low=key way to add candlelight to any space. We offer votive holders in finishes including clear, frosted, and mercury glass (silver and gold). They can hold 6-hour wax tealights or reusable LED tealights for venues that prohibit flames. Groupings of pillar candles can define a ceremony space or provide a dramatic backdrop of candlelight. For safety, our pillar candles are inside clear glass cylinders. Or, in addition to real wax pillar candles, to achieve the same look for venues that prohibit flames, we also offer wax sleeves with a reusable LED tealight. The height of pillar candles with the added sparkle of glass cylinders filled with water. Taper candles are an elegant addition of candlelight to any tabletop. 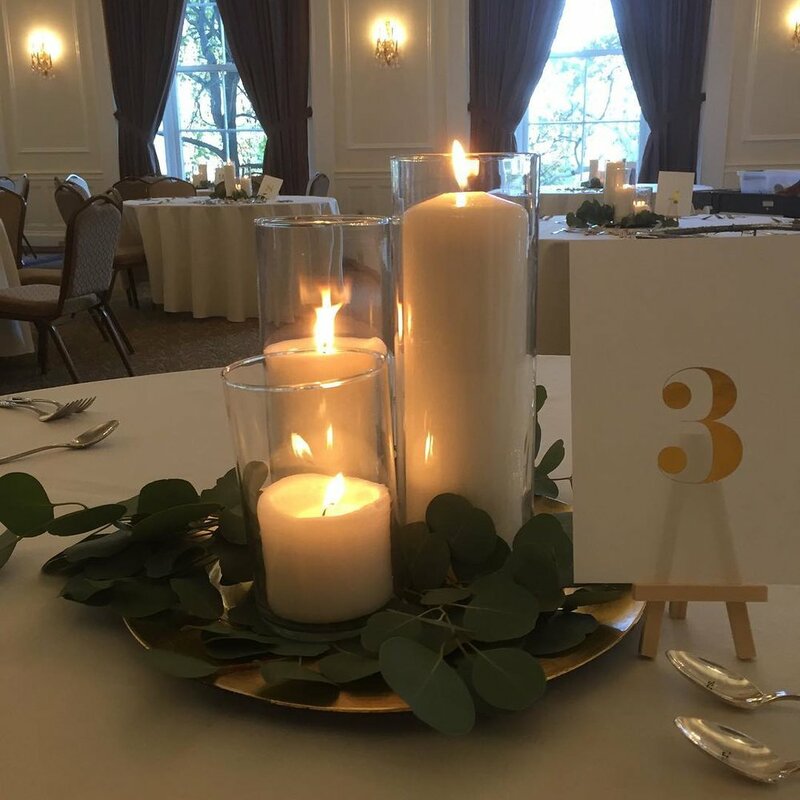 Our taper candles are available in cut glass or antique brass candlesticks and most venues require that they are burned inside clear glass cylinders for safety. Sometimes a tall candelabra is the only centerpiece you need. We have a variety of candelabras holding up to 5 candles in several heights and finishes. Candelabras can hold 6-hour tealights or LED tealights in cut glass cups, or taper candles where allowed by the venue. Lanterns can make great centerpieces, aisle markers, or outdoor lighting. We have a variety of sizes and finishes of lanterns, which can be used with 6-hour tealights or LED tealights in a votive holder or with pillar candles. Would you like to rent candles for your wedding or event? Get in touch with us. The Golden Hour Candle Company is a collaboration between greenSinner and E.F. Lighting. greenSinner specializes in floral event designs that are personal, beautiful, and sustainable. E.F. Lighting is the lighting design company used by the top event designers in Pittsburgh.